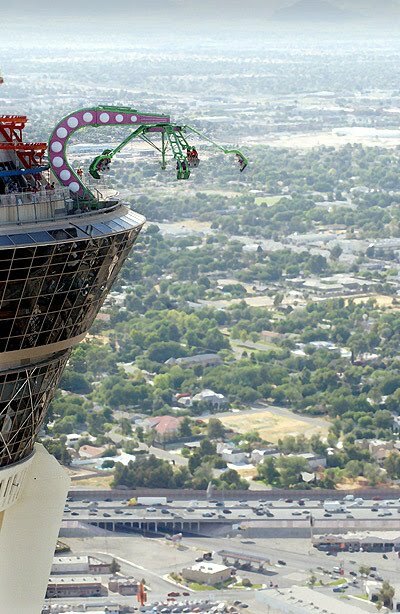 On the way to Vegas, I remember that there were some scary rides on top of a tall building, because Shayla Forsey (my good friend) rode them. I remember seeing her pictures. So I texted Kevin asking him if he would go on the rides with me and he said yes. I hadn't even seen the rides yet nor knew what they were...which may have been a mistake hahaha. 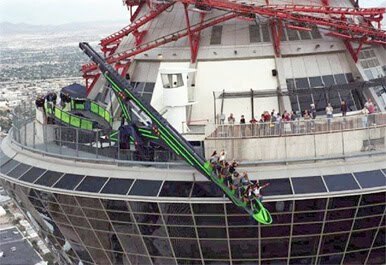 I am scared of heights and this is exactly that. 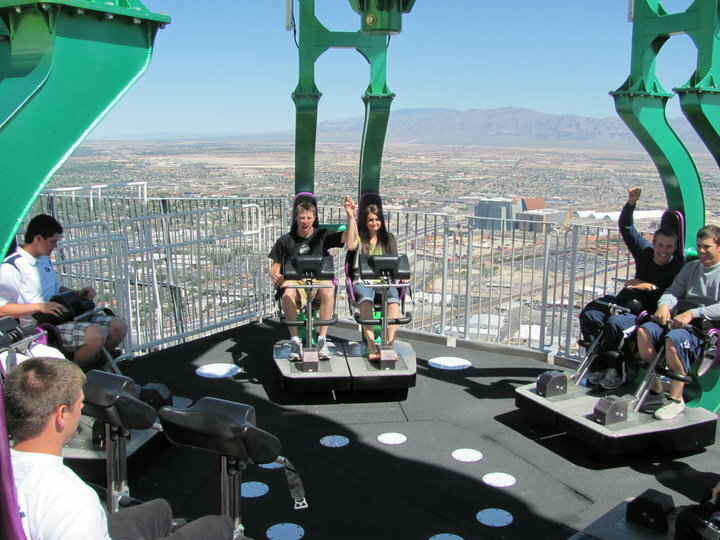 It cost $11 to ride up to the top and then $11-12 for each ride OR ride up and all 3 rides for $30. So we purchased the whole package! 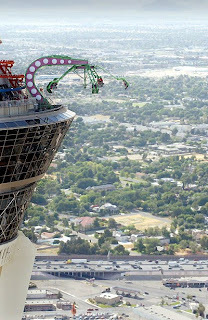 Up closer to the top of the Stratosphere...I did not like this! Kevin wanted me to stand up but I felt too scared so I sat down lol. Here we are on INSANITY. This ride was the 2nd worst ride. This is us before we rode it and I will still freaked out. Kevin and Alex Hancock & Chris Capper were making obnoxious noises on the ride like fake barf sounds lol. I was pretty much hyperventilating. Nick Birch was probably just as scared as more or more scared haha. I did. I pretty much had my eyes closed the whole ride but I did open them sometimes. Kevin & I after the Insanity ride. I was so glad to get off that thing! 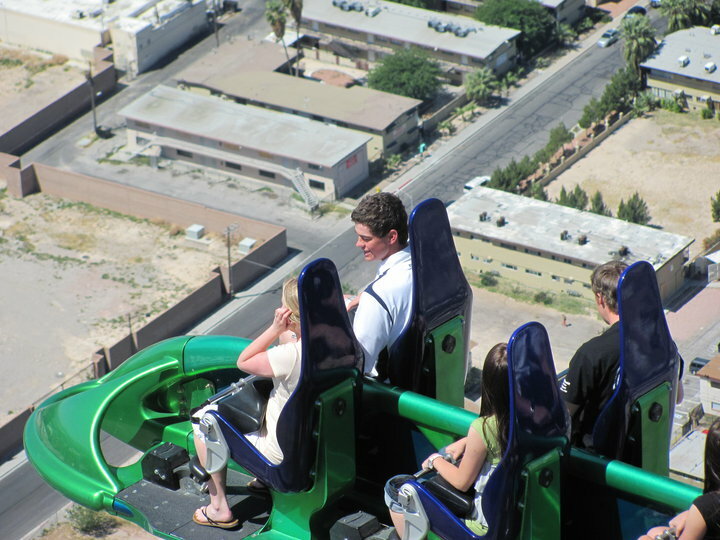 This is the 2nd ride we rode and it is called X-Sream. This was probably the least scariest ride I think. I feel better in roller coasters. 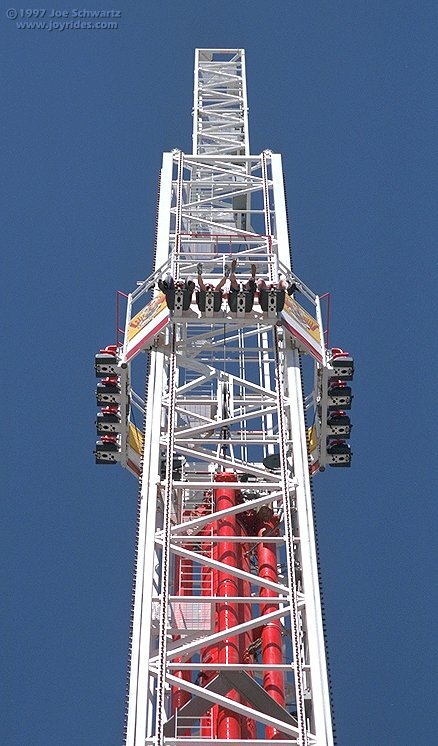 The ride would speed up to the bottom of the track and then stop suddenly (thank goodness) and then the ride would drop and you would be facing the ground more. So freaky. 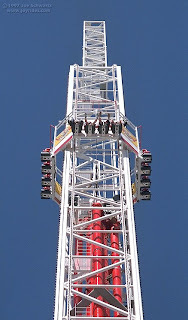 This was the WORST ride EVER!!! Big Shot. Hated it. I hate the feeling where your stomach flies out of your body. So I had to scream through it. I was holding on so hard and I think when I was falling down one time I said, "I hate this ride! I hate this ride! I hate this ride!" And then we got off the ride and there was the worst picture of me ever. They took the pics so we could buy them and we almost did. It was probably the MOST Unattractive picture of me, ever. ever taken. it was bad. Taylor & Dane Nielsen...love them!!! This was after the game before we all went out to eat at Bucco Di Beppo. 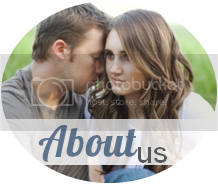 Janna & Nick Birch- LOVE them! Alex Hancock doing some weird things with his eyes!!! Agh, gives me the willies. There is no way you could get me on ANY of those. I hate that stomach flying feeling too!